*E-mail reservations will be closed at 12PM on 10th Oct, but tickets can be purchased via Peatix up till 6:30PM on 10th Oct. At-the-Door tickets will be available on the day as well. 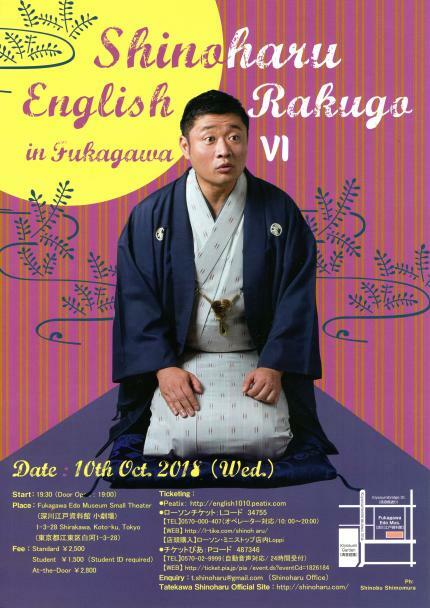 SHINOHARU TATEKAWA is a Rakugo (Japanese traditional comic storytelling) performer born in Osaka, Japan. He moved to New York at the age of eight, and since then, has spent a total of 7 years in the U.S. After graduating from Yale University in 1999, he worked in Mitsui & Co. Ltd for three and a half years. In 2002, he was so greatly impressed and inspired when he attended Shinosuke Tatekawa's Rakugo performance that he decided to give up his corporate position to become a professional Rakugo performer himself by taking up a discipleship with Shinosuke Tatekawa.